⌚SKAGEN watches: buy cheap, get postage free & fast! Without a lot of bells and whistles, but with a functional and minimalist design, the watches from Skagen come from this region. Just as the principles of modern Danish design demand. Nevertheless, despite their simplicity, the watches of the lifestyle brand are unmistakable. Quality and durability also characterise the watches' character: Skagen watches are made as companions for a lifetime. Perhaps it is the rough nature that governs life in Skagen that has awakened the watchmaker's sense of responsibility towards the environment. The materials used, the factories, the energy consumed, the measures introduced - everything at Skagen is put to the test and questioned with regard to sustainability and ethical conduct. 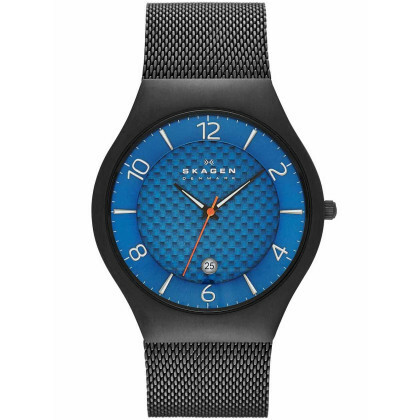 So you can choose your new Skagen watch in good conscience in our online watch shop! Shipping within Germany is free!